Despite the intermittent showers and the wet surroundings, 37 Grade 6 students from Beacon International School visited Forest Club last 21 February 2008 for a whole day of fun-filled learning activities. The field trip was organized by Teacher Trixie who brought her students to Forest Club to help them learn more about their current science studies on seed plants. Thank you for the beautiful place and the wonderful experience! 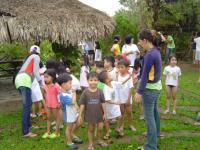 Seventy-two students and faculty from The Child’s World – A Growing Center in Sta. Mesa Heights, Quezon City held an overnight camp last 19 to 20 February 2008. This was in line with the experiential phase of their program aimed at providing meaningful learning experiences for the students. "Walang hiya kayo, pinahirapan niyo kami! ", Joel Aguada jokingly quipped as he and his seven-man team finally stumbled into the finish line. In the end though, after a hearty lunch and a refreshing dip in the heated pool, the head of Magister English Training Center was all praises for what he and thirty of his teachers and staff went through. "It was really an enjoyable and productive day. Thank you for hosting us." Mid-Term Report: Eco-Adventure Program a Success! 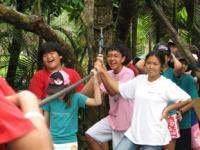 The first semester for Schoolyear 2007-2008 was a huge success for Forest Club's Eco Adventure Program! Despite the typhoons and heavy rains from July to August which caused the cancellation of many bookings, more than 2,500 students from more than eighteen schools travelled to Forest Club to experience the Eco Adventure Program. The participants varied in age, from Grade 1 and Grade 2 students of Elizabeth Seton School to college students from San Beda College and UP Diliman. One hundred thirty-four agents from SPi experienced a whole day of team building activities in Forest Club last 22 September 2007. Forest Club is fast becoming a favorite training venue for the giant BPO firm. 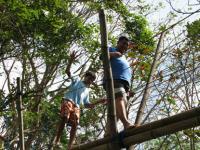 SPi has had five bookings in Forest Club this year with at least 673 participants. 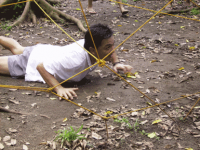 And about 700 more are scheduled to underdo team building activities in the month of October. "The Best Student Seminar Ever!" Eighty-one Grade 5 students from PAREF-Southridge School spent three days and two nights in Forest Club last 19-21 September 2007 for their Student Seminar. And they were all unanimous in saying that this by far, was the best student seminar they've ever attended. 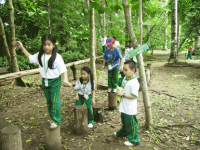 Thirty-five Grade 5 students from PAREF-Northfield School had their Student Seminar in Forest Club last September 5 to 7, 2007. Led by their head teacher Mr. Buddy Ramos, the boys spent an activity-filled three day and two night seminar that featured among others, the Eco Adventure Program of Forest Club as well as talks, workshops and a cultural presentation night. PAREF-Northfield is an exclusive boys school in Quezon City. It offers classes in the Preparatory, Elementary and High School Levels. 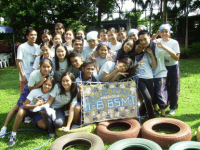 More than five hundred second year college students from Philippine Normal University (PNU) trooped to Forest Club last September 4 and September 12, 2007 for a whole day of Eco Adventure activities. Dubbed "Promoting Fitness for Life," the outdoor activity was organized by Corrie Duran of Primacor, the accredited Tour Operator of PNU. To view more photos of the activity, kindly visit our multiply site.